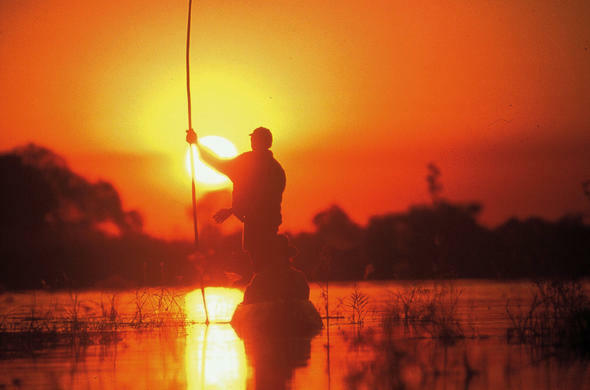 In Botswana's Okavango Delta there is a phenomenon that does not happen anywhere else on earth, a time when life-giving waters arrive on the parched floodplains at the height of the dry season. There are many incredible natural events on earth but few can match the unique cycles of the Okavango Delta located in the heart of the Kalahari Desert in Botswana, for it here where floodwaters from almost 2000 km away reach the Delta system during the dry season. In Southern African wilderness areas there are generally two seasons, the dry season and the rainy season, and although true for Botswana there is an amazing phenomenon that sets one of the areas in Botswana apart. One of nature's greatest miracles, the cycle of life in the Okavango Delta, has largely been kept from the world, but in recent times the miracle has been shared through documentaries and feature articles. The miracle that happens in the Okavango is that when the dry season is in full swing, waters arrive on the floodplains of the Okavango and the land is transformed. As a guide in Botswana for much of fifteen years, with ten of those based permanently in the area, I watched the seasons pass and recorded my thoughts and ideas in countless journals, however none of my writings can truly capture what to me was truly Eden. I recall an advert form my early years which portrayed 'the good things in life' which included 'a trip by dugout through the Okavango, a braai at sunset' with a background soundtrack of the evening chorus in the Delta. I cannot recall what the commercial was advertising but it further fuelled the obsession I had with the Okavango Delta. Whilst many kids my age dreamt of cars and maybe even girls, my dreams centered around the Okavango Delta. I read Cronje Wilmot's Okavango Adventure in my pre-teens and spent nearly R20.00, which was all my savings, on the classic coffee table book of the time Okavango: Sea of Land, Land of Water. Despite my obsession I was only able to visit Botswana in my college years for the first time, a trip that did not include the Delta, but it did fire my fascination further. I spent two weeks in Chobe and Savute with a friend that had dropped out of college to return to the bush of Botswana. An obsession with something can be unhealthy but for me an obsession with the Okavango Delta opened up a whole new understanding of the wilderness and the natural order of things and I hope that the intimate portrayal of the Okavango Delta from my years spent there, will in some way inspire you to visit this priceless world heritage.